Superkarts! USA has done it again. For the second time in the three years of the SummerNationals at New Castle, the field has been opened up to more than 44 drivers. In 2015, the first year of the SummerNats in Central Indiana, SKUSA expanded the entry roster to welcome 59 drivers. This year, SKUSA reopened the class after reaching the 44-driver mark with 56 drivers registered prior to at-track entry. This year is different. 2015 was heat races that broke up the field and required them to transfer for the main event based on their heat race results. This weekend, all the drivers will compete in the Prefinal and Final races. 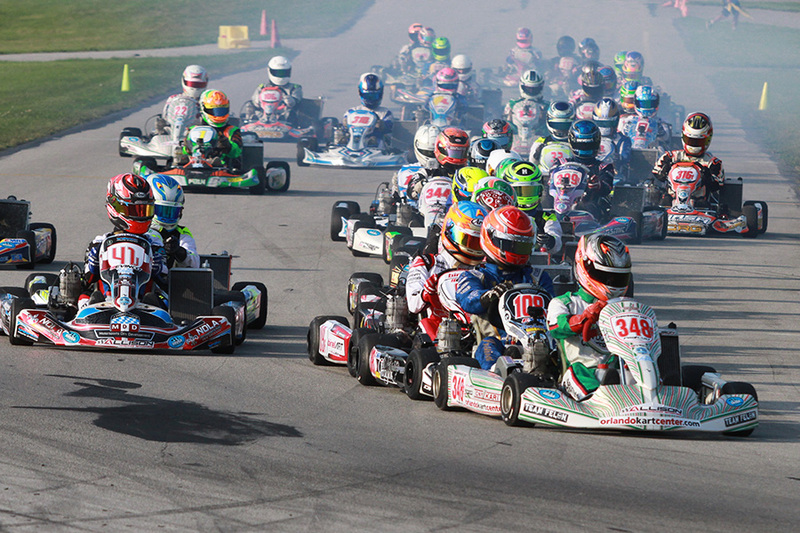 It is not common to see a near 60-kart field taking the green flag for a standard race, especially at this level. The track will be busy with action and for those four drivers in the hunt for the title, every corner, every lap, and every position will matter. The larger than normal field will be an added rival to those trying to be crowned 2017 SKUSA Pro Tour champion. Any type of trouble in qualifying or the Prefinal could mean extra work to try and recover points, needing to pass 10-20 more karts if they were relegated to the back of the field. It is certainly not the optimal stage for a large field, making it feel like the SuperNationals with 50 drivers not worrying about points, but racing for the victory. Not only is the prestige of becoming a champion on the line, but a ticket to the IAME International Final in Le Mans, France is being awarded to the SKUSA Pro Tour champion. The driver who finishes on top of the championship standings will be part of the Team USA contingent to take on the best IAME drivers from around the world at the historic facility this October. Jake Craig is no stranger to the pressure of a large field attacking him. The 2014 SKUSA Pro Tour champion was the top driver at the SuperNationals that year, starting SuperSunday from the pole position. Wrecked in the second corner, his race was done before it really started. Thankfully, the Californian had locked up the championship by that point in the weekend. This year, nothing is locked in stone. The RPM / Tony Kart driver holds a 16 point lead when factoring in the drop race over defending champion Ryan Norberg (PSL / Karting). Craig is the new #1 in the EKN Driver Rankings entering the weekend at New Castle, coming off two podium finishes at the USPKS event two weeks ago, hoping it will be the start to an improvement from his two previous SKUSA SummerNationals performances as he has struggled at New Castle. Norberg is the defending SummerNationals winner, pulling the double triumph last year. His previous success at New Castle did not translate into a strong performance two weeks ago for the USPKS event, with a fifth place finish as his best result. New Castle is the home track for Zach Holden, with hundreds of laps conducted over the years from Kid Kart to now in the Senior division. Holden was not in contention in his rookie campaign last year, and now the Indiana native is making his debut with the Energy chassis for the series finale. Holden will need to make up 84 points over the two days on a brand new kart. Mr. July Brandon Jarsocrak is rolling into the SummerNationals with the momentum. The KartSport North America / Praga driver recorded four straight weekend triumphs during the month of July. Two of them included main event sweeps in the X30 category at New Castle for the WKA and USPKS events. Wins at the Brickyard and Gearup F-Series completed the perfect month for the ‘Shillington Slingshot’. Jarsocrak is the only one of the four championship contenders to not win in 2017 or previous years on the SKUSA Pro Tour. Could this be the weekend for Jarsocrak? Braden Eves (Zero Error / Kosmic) is the fourth different winner on the season behind the top three in the standings. He and Canadian Cedrik Lupien (RPG / Kosmic) are still mathematically in the championship chase, needing to have a solid New Castle weekend to make up the 170+ points they trail entering the event. With a field of nearly 60 drivers, there are a number of possible contenders for the victories and the podium positions on the weekend. Alex Bertagnoli had a solid USPKS weekend, placing runner-up to Jarsocrak in both X30 features while winning both KA100 main events. The Senior rookie has shown the speed to fight at the front of the SKUSA Pro Tour grid, having mechanical issues and contact suffer his results the last three rounds. The Franklin Motorsports / Merlin driver is striving to rebound this weekend in New Castle. No stranger to winning both rounds of the SummerNationals is Jesus Rios Jr. The Florida native swept the 2015 event and is back for more with iKart and Comet Racing Engines power. Another name making a comeback is former SKUSA Pro Tour Junior champion Brandon Lemke. The 2015 title winner has been running a limited karting schedule with AMK / Top Kart, primed for a solid showing in his return to SKUSA competition. The 2016 SummerNationals saw AJ Myers dominate the S1 Pro division. 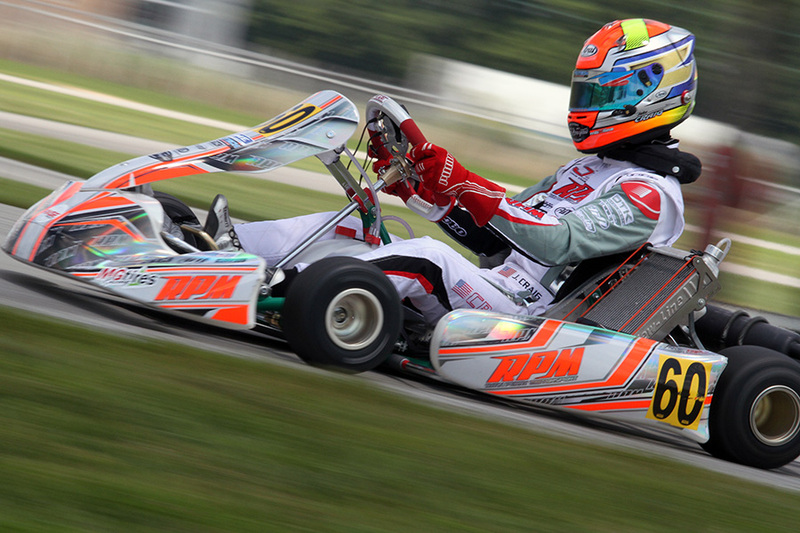 The Florida native is electing to move over to the X30 Senior division this weekend aboard his TB Kart USA entry. 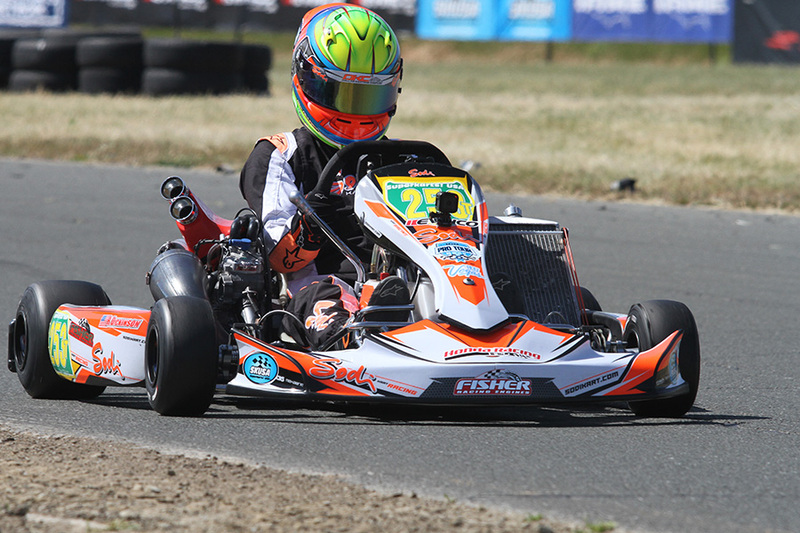 Myers has had success in the single-speed division, winning the 2015 USPKS championship. Add in SpringNationals podium finisher Marjin Kremers (PSL / Birel ART) and former SuperNationals winner Andre Nicastro (NF / Kosmic) into the mix, and the battle all weekend long is going to be fierce. Since the launch of the SKUSA Pro Tour, Texan Jake French has been striving to be among the best shifterkart drivers in the country. Grabbing his first S1 victory at the inaugural WinterNationals, the DKC / Sodi Kart driver has been focused on the second task at hand, the SKUSA Pro Tour championship. Four straight podium finishes have put French at the top of the championship chase heading into the series finale. The current #1 in the EKN Driver Rankings was among the first drivers to move up the SKUSA Stock Honda ladder system, beginning at S5 and working into S2 before advancing up to the S1 category. His lead challenger for the title is Californian Billy Musgrave. The three-time California ProKart Challenge champion has more in terms of victories, including a S2 triumph at the SuperNationals including three SKUSA Pro Tour wins in the last three years. Musgrave (MRC / Aluminos) trails French by 57 points, heading to the site of his first SKUSA Pro Tour win. The battle for the two championship contenders will be fending off those in the field at New Castle for one thing…winning. Defending champion Daniel Formal drove to two runner-up finishes a year ago behind AJ Myers. Now with the Champion Racing / Intrepid operation, Formal had a victory taken away for a broken airbox, looking for redemption at New Castle. California native Gary Carlton (LEM / Formula K) is no stranger to New Castle, having won a number of ICC victories in the Stars of Karting/CKI days. Carlton was shut out at his former home track in Sonoma back in May, and you have to believe he is determined to win one before returning back to Italy until the SuperNationals. Hunter Pickett and Nic LeDuc are the other two winners on the SKUSA Pro Tour this year. Pickett (Aluminos) won the ‘thrilla in NOLA’ feature race and stood on the podium in Sonoma. Pickett won at New Castle last year in the S2 division, and is sure to be among the quickest this weekend. LeDuc called Indiana home for some time with the California native making a return back with the Cambrian Go-Karts / Sodi Kart package. Mathias Ramirez (PSL / Birel ART) is the top rookie thus far in the championship standings, sitting third despite recording no podium finishes. Pickett is his lead challenger for the SKUSA #3 plate for 2018, as the two enter separated by just 15 points. Making his S1 debut this weekend is Franklin Motorsports / Merlin driver Kyle Kalish. The former S2 winner at New Castle is making his return to the six-speed package for the first time since SuperNationals 20 in November. The S2 category is saving the best for last, featuring 29 drivers to close out the 2017 SKUSA Pro Tour with its largest field of the season. The S2 racing, especially at New Castle, has become one of the classes to watch on the weekend. A number of raw, talented and hungry drivers compete in the category and are fighting to become the eighth different SKUSA Pro Tour champion. The title chase is down to just two drivers – Riley Dickinson and Kyle Wick. Dickinson (DKC / Sodi Kart) jumped onto the scene with his first S2 victory at the WinterNationals in his second SKUSA Pro Tour start. The now 15-year-old backed it up with a victory in Sonoma, making him the championship leader going into New Castle. Trailing by 15 points is Rolison Performance Group / CRG driver Wick. No stranger to the national scene, Wick has developed himself into a championship contender, confirming that bid with his first SKUSA Pro Tour victory in Round Four at Sonoma. The Pacific Northwest star recorded a best finish of 10th at the SummerNationals last year, so track knowledge goes in his favor. The two will be keeping on eye on each other throughout the weekend with every position of every session vital to their championship bids. On the outside looking in is Gianfranco Mazzaferro (PSL / Birel ART). The Canadian from Quebec has steadily improved his talents behind the six-speed Honda machine this season – including one podium finish – and holds the third spot in the championship chase entering New Castle. Aluminos driver Jason Pettit is fourth in the standings with a shot at the top-three of the championship podium, however, will not be in New Castle. Sky Finley (DKC / Sodi Kart) has an outside shot at the third step of the championship podium, sitting 70 points back of Mazzaferro with one podium result in 2017. 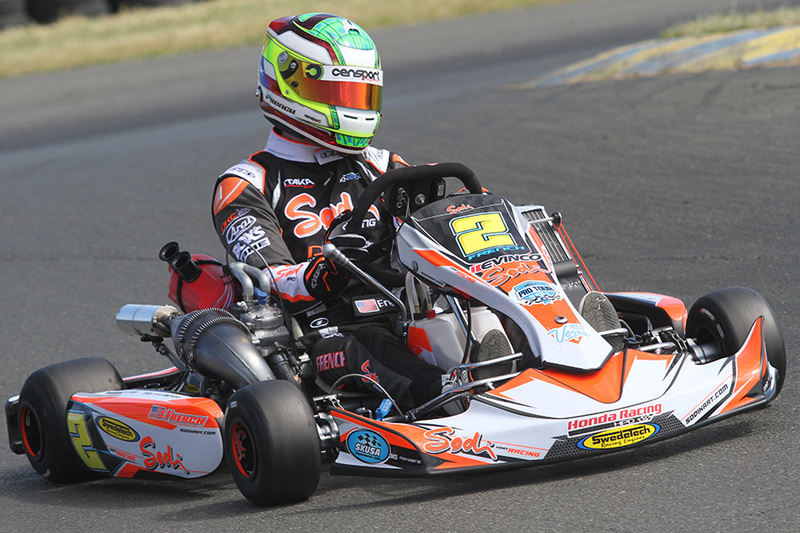 Finley earned a podium finish last year at New Castle, and the Sodi machines have been fast all season long. New Castle marks the return of Jamaican Collin Daley back to the SKUSA Pro Tour. The Round Two winner was blistering fast in NOLA but elected to sit out the SpringNationals. Back for the SummerNationals, the DRT Racing / DR Kart driver is among the favorites entering the weekend. Also returning to the S2 division is Nathan Adds as the young DKC / Sodi Kart driver is among the S2 veterans in the field. New faces to the category this weekend include Michael Ilavia (3G / Birel ART) – moving from X30 Senior, Canadian Antonio Serravalle (CRG) and RoboPong 200 winner Jimmy Simpson (Sodi Kart).